Nominated for an Academy Award® for best feature documentary, TROUBLE THE WATER takes you inside Hurricane Katrina in a way never before seen on screen. It’s a redemptive tale of two self-described street hustlers who become heroes-two unforgettable people who survive the storm and then seize a chance for a new beginning. The film opens the day before the storm makes landfall-twenty-four year old aspiring rap artist Kimberly Rivers Roberts is turning her new video camera on herself and her 9th Ward neighbors trapped in the city. “It’s going to be a day to remember,” Kim declares. With no means to leave the city and equipped with just a few supplies and her hi 8 camera, she and her husband Scott tape their harrowing ordeal as the storm rages, the nearby levee breaches, and floodwaters fill their home and their community. Shortly after the levees fail, their battery dies. 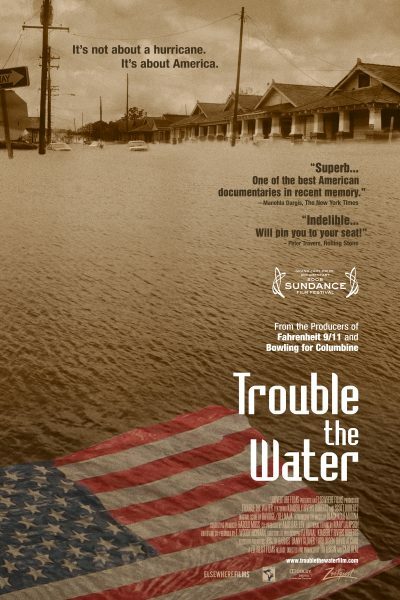 Trouble the Water was named best documentary of 2008 by the Alliance of Women Film Journalists and the African American Film Critics Association. And it was listed on many critics 2008 top ten films lists — in the Los Angeles Times, the New Yorker, Salon.com, Entertainment Weekly, The Village Voice, Times Picayune and New York magazine among other publications. Roger Ebert and Manohla Dargis both included Trouble the Water in their “best of 2008” lists.